You absolutely have to watch this movie! Instead of going into some thoughtful paragraph about how cool street art is or how interesting of a character Banksy is, I wanted to hurry up and get your attention because this is easily the most entertaining documentary I have ever seen in my life. It's rare you come across something that is not only thought-provoking but also sends you into bursts of uncontrollable laughter. Even if you don't like art or documentaries you should still watch this because it's so f****** funny. Now that I'm done gushing over this movie I guess I should tell you a bit of what it is about. 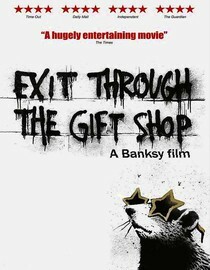 Exit Through the Gift Shop tells the story of a number of street artists and how they got started from the lens of an aspiring documentary filmmaker. However, nothing is as it seems with this movie and the filmmaker in question is one of the most incredible characters I have ever come across in my life. There is talk that it's all just a big prank, but in the end it doesn't really even matter because the ride is entertaining and the message is poignant. I'm uncomfortable telling you too much more because the thrill of finding out what the hell is going to happen next is just way too much fun. Maybe I will just keep on gushing because to be honest I'm ready to queue this movie up and watch it again. According to instantwatcher.com this movie will stream on Netflix until 12/14/13. Why is it in your queue? I'm an art fan and it seemed interesting. Is it artsy? No, but it is about art and is a brilliant critique of the art world. Somehow it doesn't feel artsy though. What stood out the most to you? The force of nature that is Mr. Brainwash. I've had this in my queue for a while, and I think I'll try and get the Hubby to watch it with me tonight, since the Oscars are on Sunday and all. Thanks for the reminder! Sure thing. I'm sure you guys will love it! Agreed. I wish this would have won an Oscar just to see what happened with Banksy not wanting to reveal his face. I love love loved this movie. I want to tea bag the makers of this garbage (not the movie). How about you give us a god damned preview instead of everyones opinion on how good it is. Believe me jacka$$'s, we know already cuz every hipster, this is their favorite movie. "I was into Bankseky ummm before the movie. I just forgot how to pronounce it right then. Must be the Paps goin straight to my head." I hate hate hate this preview and the Hipster that made it.